In the past few years, under the auspices of former transportation commissioner, Janette Sadik-Khan, NYC has taken great strides in promoting “alternative” means of transportation. 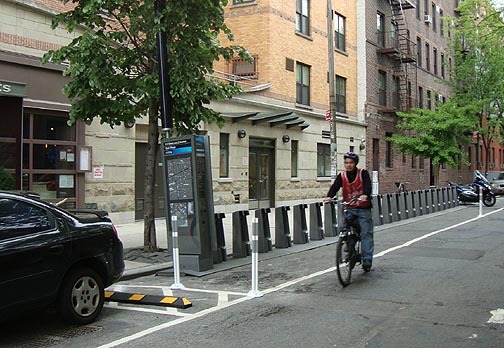 Bicycling is moving into the mainstream, courtesy of expanded bike lanes and Citibikes. Pedestrian safety is improving through street and intersection design improvements. Buses are actually becoming a viable means of getting around with the implementation of NYC’s version of bus rapid transit, Select Bus Service. Electric-assist bicycles, however, have been banned from this expansion and improvement in NYC’s urban mobility, despite their adoption in other cities and despite the fact that they are an EcoOptimistic solution in that they simultaneously address ecological and economic issues. The story of this involves a combination of conflicting and poorly conceived regulations along with misplaced blame and political expediency. Let me try to break this down and make the case for correcting this mess. [T]he issue is their treatment as motorcycles under New York State law, and motor scooters in New York City. This is in contrast to federal law, wherein an electric bicycle is officially defined as a “two- or three-wheeled vehicle with fully operable pedals and an electric motor of less than 750 watts (1 hp).” This means that in New York State, electric bicycles are generally considered unregistered motor vehicles and subject to the same laws and penalties as automobiles. In New York City, electric bicycles that do not have the ability to be operated solely by its motor (pedal-assist bicycles) are legal, but those that do have that ability (motor-assist bicycles) are subject to fines and impoundment. Attempts to legalize e-bikes at the NYS level have failed in recent years. NYC, meanwhile, has taken the opposite approach with new laws to further restrict e-bikes. And, of course, there’s a story behind that, too. Why, you may reasonably ask, would NYC want to outlaw the use of a congestion and pollution relieving mode of transportation? There are a few explanations. First is the confusion about the regulations. It’s been unclear what exactly NYC’s current reg’s restrict. So, rather than clarifying the rules to make them legal (and consistent with the supposedly superseding federal reg’s), the rules have been tightened so that it is easier for the police to ticket e-bike riders. And it’s worse than that; the police can actually confiscate e-bikes on the spot. Imagine if ticketed drivers had their cars confiscated. Another reason is closely related to the ongoing debate and public perception of cyclists as dangerous and selfish law-breakers. In both groups, bicyclists and e-bikers, there are some bad apples. Riding on sidewalks is an especially egregious example, as is recklessly running through red lights and pedestrian crosswalks. But banning the entire mode of transportation is not the solution. In fact, a recent study shows that as more people are riding bikes in NYC, safety awareness has increased, and there’s every reason to believe that e-bike riders would follow the same pattern. The problem the city faces is not how to restrict e-bikes, but how to enable alternative means of transportation that relieve congestion, pollution and safety issues. Progress is being made in terms of beginning to reverse the car-centric approaches that were prevalent until recent years. But bicycling still faces opposition from a very vocal minority, and e-bikes have even less support since most New Yorkers have never ridden one. The speed restriction issue doesn’t exist for classifications of motorcycles. 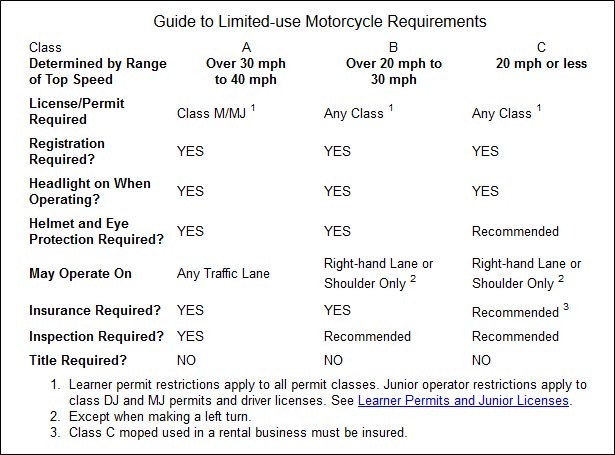 There are different licensing, insurance and operation rules for types of motorcycles based on their speed. What keeps e-bikes from being classified the same way? As far as I can tell, the problem is solely that e-bikes don’t have VINs (Vehicle Identification Numbers) stamped into them and, therefore can’t be registered and receive license plates. But that hasn’t prevented other places from legalizing them. From “New York Moped Laws,” http://moped2.org/laws/new-york.htm. But e-bikes are not considered mopeds. Then, having sorted out the legal morass and the short-sighted reactions to the few “bad apples,” let’s take it a step further and add e-bikes to the Citi Bike program. A commercial ZipCar-like version of this using electric mopeds is already expanding in San Francisco (where electric assist is probably greatly welcomed amidst the hilly streets). E-bikes are a logical expansion of urban-friendly transportation. They relieve congestion, diminish pollution and create more alternatives, especially for those who may not have the ability to pedal a conventional bicycle. Banning them is simply the wrong way to go. This entry was posted in Policy, Transportation, Urbanism and tagged bicycling, e-bikes on February 12, 2014 by David Bergman. Cycling is a great example of an EcoOptimistic solution, as I’ve written about before. It works on so many angles that it surpasses the win-win-win solutions that I often discuss here. It relieves congestion since replacing a car with a bicycle takes up much less space. It relieves pollution since it is essentially a zero-emission mode of transportation. (Not counting the incremental increase in food required to generate the human muscle power.) It takes a lot less energy and materials (some of them toxic, like PC and the nasties in batteries) to make a bicycle than a car. It improves health since, instead of sitting in a car, you’re powering the bicycle. And it’s good for us in another significant way by reducing both the number and severity of accidents; a bicycle and rider, at cycling speeds, constitute a lot less inertia than a one or two ton vehicle at driving speeds. Which leads us to one of the two cycling topics filling my blog world this week. The first one is known as the Idaho Stop, a law that’s been in place in Idaho for 30 years and is now being considered elsewhere, that says a cyclist may proceed through a stop sign or red light after slowing or stopping to verify that there is no conflicting vehicular or pedestrian traffic. 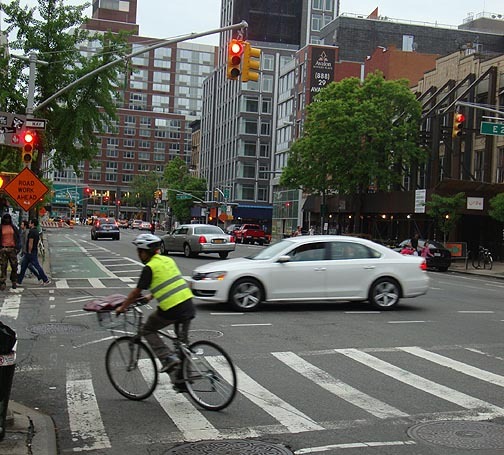 In essence, a cyclist can treat a red light as a stop sign, and a stop sign as a yield. The discussions this week arose largely due to an Atlantic Cities post by Sarah Goodyear, whose writing I usually enjoy and agree with. This post, though, was titled “Cyclists Aren’t ‘Special,’ and They Shouldn’t Play by Their Own Rules.” The gist of her point, which I’ve heard from friends as well, is that cyclists should have to obey the law just as drivers do. Technically, legally, of course, that’s correct. But that’s close to where my agreement with Goodyear ends. While I wouldn’t say cyclists are special – that implies a category better than others – I think the relevant point is that cyclists are different, in the sense that a person on a 20 or 30 pound bicycle riding at single digit speeds is very different from a person in a one or two ton vehicle moving at double digit speeds. It’s basic physics: the much greater mass moving at higher speeds can cause magnitudes more damage. Plus cars and trucks are much larger and less maneuverable. Actually, I do sympathize somewhat with the delivery cyclists. When a delivery is four blocks away but the wrong direction, and because of one-way streets the alternative involves adding an extra three or more blocks, and you’re getting paid by the delivery, the temptation to take the shorter route is high. I’ll ride the wrong direction on occasion, too. I have a choice, when riding home, of going about 150 feet the wrong way on my low-speed lightly-traveled block, or going an extra five blocks, three of which are on much more trafficked and dangerous streets, and involve crossing a major street twice to get to and from the bike lane. I endanger no one in my brief sojourn in illegality and, in addition to adding a lot of time, endanger myself far more by taking the legal route. But, unlike the simple and clear Idaho stop, I’m not sure how to legitimize the good judgment I feel I exercise there. I’d be willing, though, to trade off that example (and perhaps walk my bike that 150 feet) for the peace of mind of being to proceed slowly through a stop when all is clear without risk of getting a one or two hundred dollar ticket. In short, make the rules make sense and then apply them as rigorously as they are applied to drivers. At the outset here, I said there are currently two cycling topics causing much bloggery. That second one is more New York City-specific and has hit both new media and traditional press, provoked by the rollout of the long-awaited CitiBike share system. (The racks have been appearing over the last couple of weeks. The bicycles come next and the system goes live on Memorial Day weekend.) Though the city held many public meetings to determine the locations of the bike racks, it now seems, to judge by the recent reports and letters, that people are surprised and aghast. Dig a little deeper and you’ll discover that it’s a small percentage that’s upset by the racks. There’s one note on which a friend who has serious bike share issues and I agree: couldn’t they at least have designed the information kiosks so they could stand up straight? Most of the objections, I think, come more simply from our resistance to change. There’s a physical aspect of change: the street or the park is going to look a bit different, and that takes getting used to for some. Equally important is resistance to challenging the primacy of cars. Why is it okay to provide (sometimes free) storage of private cars, taking up valuable public space, but not okay to provide storage spaces for public bicycles? I suppose it’s easy for me, a car-free person (“carless” sounds like I’m deprived and missing something), to pose this question. But really, why should so much public land be given away to those who own cars, especially in a city like New York where most people don’t have cars? If car owners had to pay the real cost of the land they use for parking (here comes my economist side sneaking in again), you can bet there’d be a whole lot fewer cars and more bicycles, mass transit and car sharing. And a whole lot less congestion as well as a whole lot more open space for truly public use. I’m sure there a few Citibike rack locations that need rethinking and perhaps relocating, which is precisely why the racks are designed to be easily moved. Let that public process happen. Indications are that the city Department of Transportation fully expects this to occur in some instances. But let’s keep that perhaps innate resistance to change in mind. Let’s allow some time to try it and see how things go. The experiences in London and elsewhere prove the validity of this approach. My prediction is that 99% of the locations will be just fine once we get used to this new and highly useful part of our streetscapes, and bike sharing will soon be seen as an integral part of cities’ transportation networks. We’ll all — cyclists and non-cyclists – enjoy less congested, less polluted and safer streets. This entry was posted in Policy, Transportation and tagged bicycling, Sarah Goodyear, win-win-win on May 19, 2013 by David Bergman. The great James T. Kirk once said (or is it ‘will say’ since it takes place about 270 years from now?) “I don’t believe in the no-win scenario.” My much less quotable version of this might be “I don’t believe in the zero-sum scenario” — at least not in the case of environmentalism, where I like to point out the many win-win and win-win-win scenarios. A zero-sum game is “a situation in which a gain by one person or side must be matched by a loss by another person or side.” Because of misperceptions of competing interests, environmental issues are often seen as resulting in, at best, zero-sum results. Gains for the environment, for example, are seen as necessarily won at the expense of jobs or energy prices. Developed countries are pitted against developing countries. You get the idea. On a smaller — and therefore perhaps more personal — scale, bicycling as an alternative form of transportation often ends up in verbal skirmishes with drivers (played out in the news and, sometimes, the courts), who see bike lanes as stealing space from vehicle lanes, and business owners, who fear shoppers won’t come if they can’t park in front. With the recent expansion of bike lanes here and elsewhere and an accompanying growth in cycling, both bicyclists and drivers are in a transitional learning period. Cyclists – especially the “old timers” – need to adjust to the fact that they are now a legitimate part of cities’ transportation networks and, as such, need to be responsible. 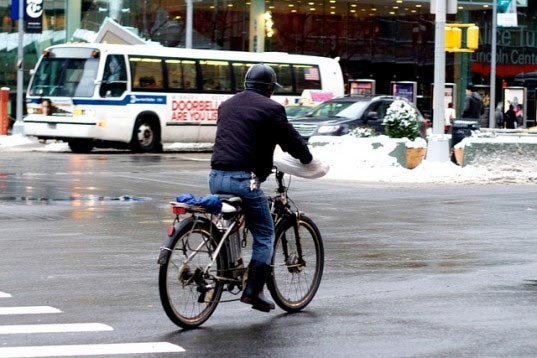 (I’ve been cycling in NYC for over 30 years both for utility and recreation, and have more recently become more, um, law-abiding, in part to be a cycling “ambassador” and offset some of the ill-will generated by more selfish riders.) 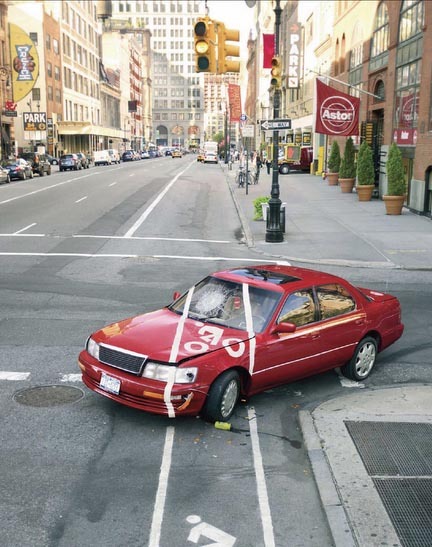 Drivers, for their part, should realize that every bicycle represents one less car and, therefore, that much less traffic congestion and that many more available parking spaces. Win-win, like I said. Actually, it’s better than that, with at least three wins we can tally. But let’s back up slightly to a story that made headlines last week. Washington state Representative Ed Orcutt believes bicyclists get a literal free ride in that they don’t pay gas taxes while using roads. (The bigger headliner was that he also said that cyclists pollute because they exhale more carbon dioxide while pedaling. He later partially retracted that Onion-ready statement.) Never mind that gas taxes often don’t cover a lot of the costs of road construction and maintenance, or that the idea of person plus a 30-pound bicycle, utilizing a space maybe 2 feet wide by 4 feet long, contributes any sizeable wear to roads compared to a 4000-pound, 16’ long by 6’ wide car is ludicrous. Orcutt isn’t alone in proposing bicycle taxes. Special fees have been proposed in adjacent Oregon (and I thought the Pacific Northwest was the bastion of treehuggers! ), are in place in Hawaii, and sales taxes are actually being levied in Colorado Springs. I’ve written about perverse subsidies (here and here); these are perverse taxes in that they discourage an activity that is beneficial to society. Let’s enumerate some of those beneficial aspects of cycling. Cycling is virtually emissions free. I say virtually because the human pedal power comes from calories which, of course, come from food. But the incrementally larger amount of food needed to generate that human power is negligible, especially when compared to the power required for other means of transportation. 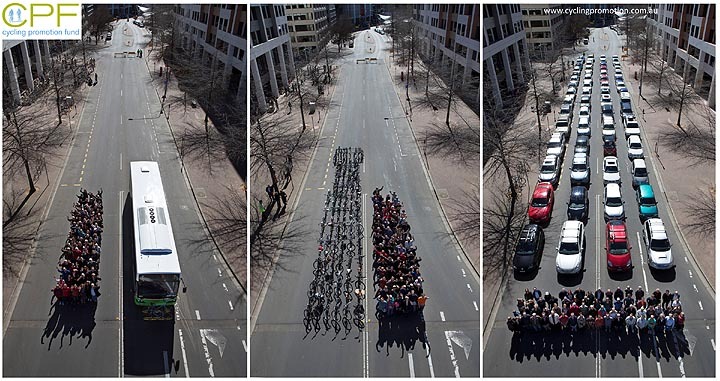 Cycling reduces traffic congestion and saves time for all, including drivers. This is true even after accounting for traffic lanes removed for bike lanes. Cycling also has public health benefits. Driving, as a sedentary “activity,” can’t make that claim. In an age of obesity and lethargy, we all benefit from the reduced health costs. 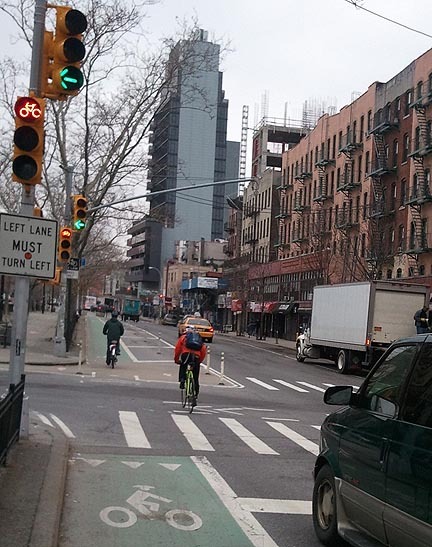 ….businesses on Eighth and Ninth Avenues in New York saw a 50 percent increase in sales receipts after protected bike lanes were installed on the corridor. On San Francisco’s Valencia Street, two-thirds of the merchants said bike lanes had been good for business…. [and there’s] a Memphis neighborhood where people, without authorization, spent $500 on paint and made their own bike lanes. Six months later, commercial rents on the strip had doubled, and all the storefronts – half of which had been vacant – were full. That initial concerned reaction from storeowners is understandable in the context of our car-centric culture. And like the common but incorrect assumption that adding lanes to highways reduces congestion, it intuitively makes sense. You know all that advice about intuition and trusting your gut? It’s not always right. Data tend to be more conclusive. Are there losers when space or funding is taken from cars for bicycles? Certainly. But all pointers seem to indicate that there are far more winners, including among drivers and storeowners. Since I started here with a quote from Star Trek, it seems fitting (if geeky) to conclude with one, this time from Mr. Spock: “logic clearly dictates that the needs of the many outweigh the needs of the few.” The few here are a smaller subset of the small number who drive in cities, a fraction relative to the numbers of pedestrians and cyclists and the good of the public in general. The basis of EcoOptimism is the win-win symbiotic ecological and economic solution. Environmental initiatives, when implemented well, result in more jobs, a stronger economy, a healthier population and, for our added convenience, a world we can still live in. This entry was posted in Economics, Policy, Transportation, Urbanism and tagged bicycling, win-win-win on March 13, 2013 by David Bergman.